The marketing world has been going through a period of rapid change over the last five years. What most business owners or marketers know about marketing has been completely flipped on its head. Marketing campaigns that worked 10 years ago are now falling flat with little to no results, leaving many frustrated. In years past, marketing was a one way communicator. Companies would pay to have their message placed in front of consumers and a certain percentage of these consumers would convert into sales. It was a wonderful world where the more money you threw into advertising, the more sales you would get. For years this is how traditional media advertising (TV, radio, Magazines, etc.) worked and the world was a wonderful place. Then along came the internet and everything changed. What had previously worked, was no longer working. Technology and the internet made a fundamental shift in power happen. Previously the power was held by the advertiser who would push their messages in front of people whether they wanted to see it or not. With the emergence of the internet and new technologies such as DVR, streaming video, satellite radio, etc. consumers now hold the power and can block out the disruptive marketing messages of traditional media. Social media moved marketing into a two way communication channel where both good and bad news can spread like wire fire in a drop of a hat. So with so many traditional marketing mediums now showing little or no return on investment, many business owners and marketers are asking, “Now What?”. They are confused and frustrated with finding a new, effective way to engage and get in front of consumers. But there is no need to get frustrated, there is an answer, however, the answer requires a shift in what we think of marketing as we know it. Then about 6-8 years ago a new style of marketing emerged. Inbound Marketing has been proven extremely successful for thousands of businesses worldwide and is exploding in popularity. Businesses have been able to skyrocket website visitors, boost lead conversions and ultimately grow their businesses in ways they never through imaginable. 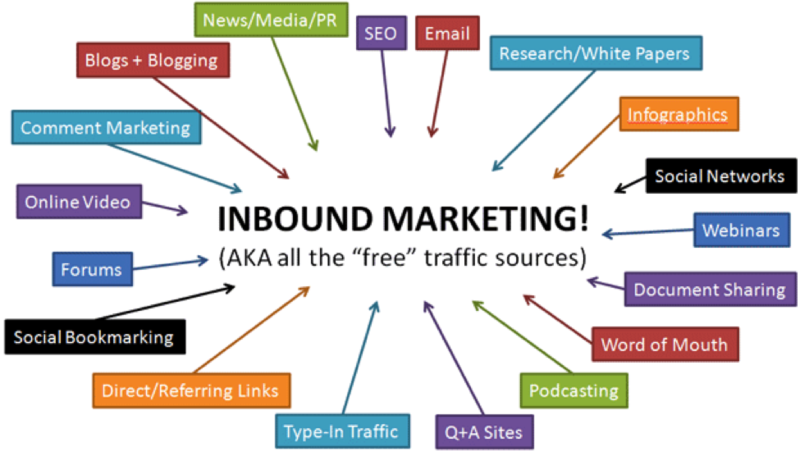 But What Is Inbound Marketing? Inbound Marketing is all about earning your audience’s attention instead of traditional marketing methods of begging, buying or stealing your audience’s attention. People are curious and hungry for quality information about topics that interest them. So where do people go to look for information? Well, answer me this question: When you are looking for information on a particular topic, where is the first place you go to find information? I would bet that you answered, “Google” or “The Internet” and that’s exactly where everyone goes. So if your business can provide amazing informative content in the form of a blog, ebooks, webinars, checklists, etc. Then those individuals looking for information on the industry will be excited and happy to come to your website to learn more. In addition to drawing in people on the web searching for great information, you can also drive traffic to your website by promoting that same content using targeted social media marketing, email marketing and other methods typically associated with Internet Marketing. Getting individuals interested in your industry to your website is only the first step to the Inbound Marketing process. Once on your website, you need to convert them into a lead by having them fill out some sort of form in exchange for more quality information. In this stage we talk a great deal about conversion marketing such as designing effective call-to-actions, optimizing landing pages and UX/UI elements. A great deal of testing and measuring is done in order to maximize the conversion rate of every visitor coming to the website, no matter what stage in the buying lifecycle they are in. With Inbound Marketing we have a funnel broken into different stages depending on where in the buying lifecycle each person is. As we start converting visitors into different lifecycles, we need a way to nurture those leads down the funnel, eventually getting them to the bottom where they want to talk business. We can leverage custom tailored, automated lead nurturing campaigns to help future educate, engage and attract leads to our content. As we continuously educate them, we can move them down the funnel while answering common questions and objections. By the time they get to the bottom of the funnel, they are an extremely qualified lead who is fully educated on your industry, products and company and already has many of their questions answered. This will help make your sales team’s lives easy and shorten buyer sales cycles. With advances of technologies and new was to block out unwanted noise, the world is rapidly changing and so should your marketing. What we covered in today’s blog is a global introduction to Inbound Marketing. It is a very complex and integrated system that requires a great deal of work to get rolling, however, once started your business will see huge results and massive growth.